Staircase parts from the Classic White Oak range made by Richard Burbidge. Here is a selection of half newel post bases for stair and landing balustrade. 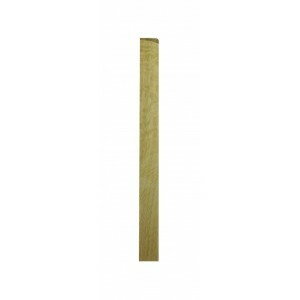 43mm x 90mm half newel bases complete half newel posts that join handrails to walls. Half newels look much neater when fixed to a wall compared to a full sized newel. Traditional stair parts for larger staircases made from a beautiful white oak. Base sections for a post to post handrail systems that join at the newel posts. These bases are in varying lengths for use on different sections of the handrail and stair to ensure the balustrade will accommodate your stairs.